Our reading this week, felt very scattered. Even though all of our books fell under the Thanksgiving umbrella, they were very different, from fun and fanciful, to fact filled and less frivolous. 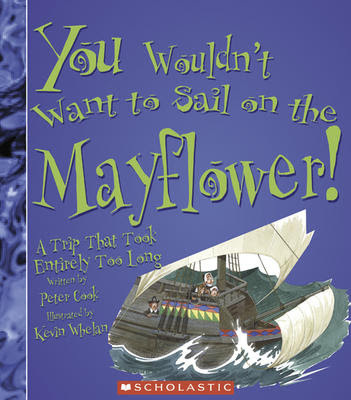 Straddling the gap, was Peter Cook's You Wouldn't Want to Sail on the Mayflower! A Trip That Took Entirely Too Long. Amazon has it marked for ages 4-8, but I'd say more 7-11. Like all of the books in the series (and there are a lot of them), it presents non-fiction details of a historical time period, in a comic book like format. My older children, and I, enjoyed it well enough, but the younger children found it a little too long, and busy for their liking. I picked up Edna Barth's Turkeys, Pilgrims, and Indian Corn, The Story of the Thanksgiving Symbols, mainly for myself, to fill in some of the history, and details of our traditions. It could easily be read, and enjoyed by older children (ages 7-12) too, though. This book was written in the 1970's, so I was surprised to find how many of the myths, like Pilgrims wearing black, and living in log cabins, and the Indians in tipis, with feathers in their hair, it debunked. If we've known all these things weren't true for so long, why do we keep teaching them? I guess, it's because the myths are so much cuter than the reality. 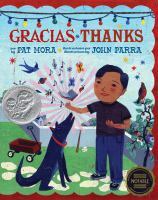 The younger children enjoyed Pat Mora's Gracias/Thanks. With Spanish text on one page, and English on the next, readers follow a small boy, as he lists off the everyday things, that make him happy, and says "thanks". 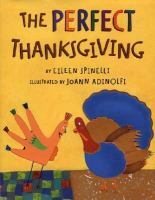 I checked out The Perfect Thanksgiving by Eileen Spinelli, because I usually enjoy her books. And, the children enjoyed this one, comparing two different families', different ways of celebrating Thanksgiving. I found the comparison of classes strange, and unsettling in a children's books though, as one family seems to be from the upper, educated, elite, while the other is a lower class, "average American", family. Although both families are said to be perfect in the end, most of the book is dedicated to pointing out the superiority of the upper class. 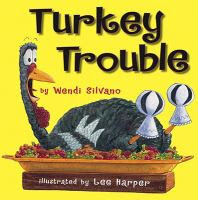 But, Turkey Trouble by Wendi Silvano, was nothing but fun. As Thanksgiving approaches, Turkey seeks to disguise himself, to blend in with the various animals on the farm, who he thinks are less likely to be chosen as a holiday entree. Finally, he settles on the perfect disguise, saving not only himself, and his barnyard friends, but the farmer's Thanksgiving dinner, as well. I'm hopefully getting in Turkey Trouble later today, fingers crossed. It certainly looks super cute. Oooohhhhh, and the Thanksgiving Symbols is also very cool. My daughter loves Turkey Trouble- such a fun book! I am doubtful I will get any Thanksgiving books again this year. I thought I would jump early but guess what they were already gone. These sound like great books! Without the myths, crafting wouldn't be quite as fun I guess. I have a few turkey books on hold at the library, but not Turkey Trouble. Our favorite Thanksgiving book is Give Thanks to the Lord by Karma Wilson. It's not really about the history behind Thanksgiving though and focuses on giving thanks during a Thanksgiving celebration with family. I think I'll look for Turkey Trouble for my boys and maybe the symbols book for myself (and my 7-year-old). Turkey Trouble sounds very interesting, and I kind of agree with you on Spinelli's book that we read last year. 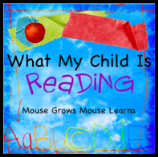 I leafed through some of those "You Wouldn't Want..." books in the bookstore and agree with your assessment - the reading age is given incorrectly, and they are more appropriate for older kids. Thanks for joining WMCIR!